Graffiti Brasil Book Luanch Night & Batmacumba Club Night this Sat 08 Oct 2005. 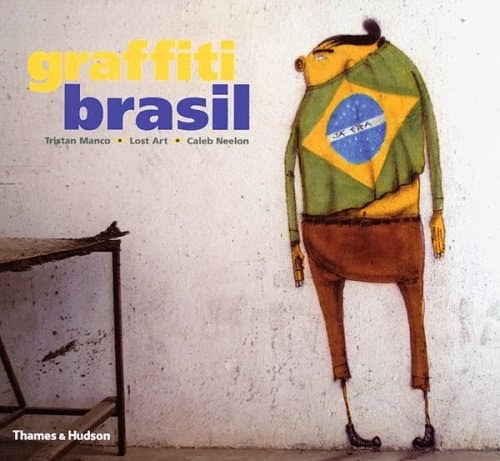 Batmacumba goes deep into the urban underground of Brazilian culture to present, in association with Thames & Hudson, the launch of the new Graffiti Brasil book, a study of one of the most exciting graffiti scenes on the planet. From extreme conditions of deprivation to highly crafted murals Graffiti Brasil offers a stunning insight into the local scene. Graffiti Brasil is the result of collaboration across three continents. Tristan Manco is from England, and is the author of the best-selling Stencil Graffiti and Street Logos. Caleb Neelon (SONIK) is an artist and writer from Boston, who has been traveling to and painting in Brazil since 1997. Ignacio Aronovich and Louise Chin are "Lost Art," and have for many years documented the streets of Brazil from their home city of São Paulo. With graffiti worldwide becoming more homogenized, this book is a reminder of the strengths of creative independence and the rich fruits of cultural diversity. To give a flava of the whole Brasil graffiti scene they have short videos and hundreds of images from Rio and Sao Paulo plus the The Lt Crew (Latin Team) will be displaying original artwork made for this event. On the decks DJ Cliffy digs deep into the latest urban sound from Brazil and the Brazilian diaspora from funky sambas to folk electronica. The book is available from all good bookshops and here on amazon.